A group of friends goes on a hiking trip to pay respects to a former member of their group who was killed in a liquor store robbery. During the trip, one friend hurts his leg so, in order to make the hike shorter, they decide to take an alternative route through the forest. Once they are in the forest, strange things start to occur. Oh no! Someone in our hiking party is injured! What should we do!? Should we stick to the well-charted and often patrolled path, or should we take a shortcut through a thick forest full of unknown terrain that will obviously not be faster even though it's shorter? 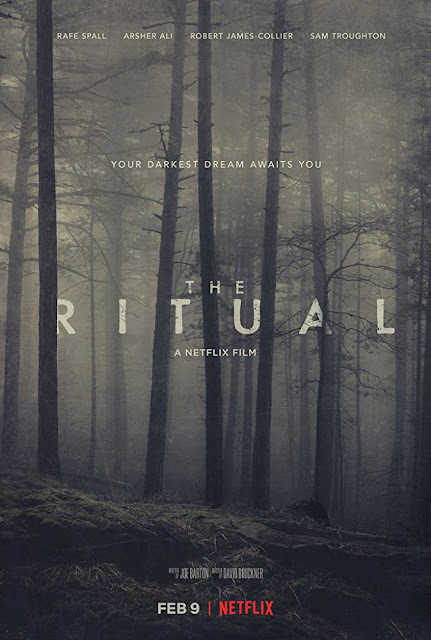 Well, "The Ritual" This movie is directed by David Bruckner, who has directed numerous horror films including "The Signal," "Southbound," and the "Amateur Night" segment of the horror anthology "V/H/S." It is written by Joe Barton, who also wrote the Netflix sci-fi superhero flick "iBoy" and is based on the novel by Adam Nevill. The film stars Rafe Spall, Sam Troughton, Arsher Ali, and Robert James-Collier as Luke, Dom, Phil, and Hutch, a group of old college friends who go on a hiking trip to pay respect to another friend of theirs who was murdered in a convenience store robbery. On the hike home, Dom twists his ankle and believes he has torn his meniscus. Hutch proposes the group take a shortcut through the forest to shorten their journey back to civilization. Once they are in the woods and cannot turn back, they come across a creepy cabin full of witchcraft relics. From that point on, weird things start to happen as they completely lose their way and may even lose their lives. When "The Ritual" first starts off, David Bruckner does a good job establishing an eerie mood and succeeds in building tension early on. However, as the film progresses, all of that pent up mood and anxiety dwindles away as the story starts to feel repetitive and loses its creep factor very quickly. It sets up a bunch of mysteries as to what really occurred the night they spent in the witch's cabin, but the story doesn't do a sufficient job answering the questions that arise from these mysteries. It is never all that clear what is a hallucination and what is actually real, which left us wondering what the overall point really was. What we hoped would be a moody horror film with a little more depth turned out to be a rather basic "boo! in the night" creature feature. It regularly borrows elements from other flicks and uses genre tropes to the point of cliche. Once the scary movie elements kick in, there is nothing but confusion and conflict. There is no real rhyme or reason to it all. The narrative doesn't have a good cause and effect progression. It seems like there are specific moments Bruckner wanted to add into the movie but had trouble finding ways to get them to fit naturally into the story, so he said: "screw it, I'm going all in!" The final act feels very underwhelming and is extremely unsatisfying. We thought the writer and director were trying to truly say something deep about regret, but this entire aspect seems like nothing more than a plot device. By the end of it, regret has little to do with the overall theme of the film. "The Ritual" is competently made and well acted, but it sets the audience up for a deeper, more meaningful story that's always lurking just below the surface, but unfortunately, it never comes.